By the late sixties, the members of many British and American bands were well on their way to becoming multi-millionaires. Especially groups like The Beatles and Rolling Stones. They had been at the top for the best part of a decade, and were now enjoying wealth beyond their wildest dreams. To look after their wealth, these groups employed accountants, investment companies and tax advisers. They ensured that their clients minimised their tax liability and became even wealthier. It was changed days. No longer were the angry young men angry. Instead, they were affluent and aspirational. Where had the spirit of rock ’n’ roll gone? It was alive and well, and living in Heidelberg, Germany. That’s where The Guru Guru Groove, who later became Guru Guru, had been formed in 1968 by drummer Mani Neumeier, bassist Uli Trepte and guitarist Eddy Naegeli. However, even The Guru Guru Groove hadn’t started off as a rock ’n’ roll band. Instead, The Guru Guru Groove’s roots were in the German free jazz scene. They had previously worked with Swiss pianist Irène Schweizer. Drummer Mani Neumeier was also a stalwart of the German free jazz scene, and already, had won a several prizes. However, by 1968, when The Guru Guru Groove was born, its members were embracing psychedelic rock. The three members of The Guru Guru Groove had been won over by American and British psychedelic rock. Jimi Hendrix and Franz Zappa had inspired Mani Neumeier, Uli Trepte and Eddy Naegeli. So had The Crazy World of Arthur Brown, the Rolling Stones and Pink Floyd. These bands inspired not just The Guru Guru Groove, but Amon Düül, Can and Xhol Caravan. They would play an important part in the nascent, but burgeoning German music scene of the late sixties. Unlike the American and British rock scenes, commune culture played an important part in the German music scene at that time. The three members of The Guru Guru Groove lived in a commune in the Odenwald region, where they experimented with various hallucinogenic drugs. Many of The Guru Guru Groove’s early concerts took place in communes. Soon, though, The Guru Guru Groove were a familiar face on they university circuit. The Guru Guru Groove organised concerts with the Socialist German Student Union. This wasn’t surprising. Like many German bands of this period, The Guru Guru Groove were politically to the left. They were essentially a socialist band, who unlike many of their American and British counterparts, had a social conscience. This became apparent during concerts. Concerts organised by The Guru Guru Groove and the Socialist German Student Union were spectacles. The band didn’t just take to the stage, play a few songs then say their goodbyes. Instead, members of The Guru Guru Groove read political texts between the songs. Sometimes though, the concerts descended into near anarchy. This didn’t seem to matter. All that mattered was the music. It was a fusion of free jazz, avant garde, psychedelia and rock. The three musical alchemists combined elements of these disparate genres, wherever they played. Sometimes, this included prisons, where The Guru Guru Groove introduced inmates to their mind bending sound. By then, they were well on their way to becoming one of the leading groups in the German underground scene. It wasn’t all smooth sailing though. Change was afoot. The Guru Guru Groove became Guru Guru, who would become one of the leading lights of German music. Guru Guru’s lineup would also change twice. Guitarist Eddy Naegeli was replaced by American Jim Kennedy. Then Ax Genrich was drafted in to replace Jim Kennedy. By then, Guru Guru’s lineup featured drummer Mani Neumeier, bassist Uli Trepte and guitarist Ax Genrich. This is regarded as the classic lineup of Guru Guru, and the one that recorded their debut album UFO in June 1970. It’s recently been reissued on vinyl by Play Loud Productions. When Guru Guru entered the studio for the first time, Julius Schittenhelm who was a producer for the Ohr label, and his wife Doris must have realised that they were about to record what was, no ordinary band. Guru Guru were far from a power trio, featuring drums, bass and guitar. The three members of Guru Guru unpacked, and setup a wide array in instruments and electronics. Drummer and vocalist and Neumeier added cymbals, gongs and a tape to his setup. Bassist Uli Trepte added various electronic items, including a transistor radio, mixer and intercom. New guitarist Ax Genrich added an array of effects pedals, including an Echogerät Pedal. Ax and the rest of Guru Guru were determined to record a debut album nobody would forget. So it proved to be. Guru Guru released UFO on the Ohr label, later in 1970. It was released to almost overwhelming critical acclaim, and hailed as a groundbreaking fusion of genres and influences. These growing reviews lead to UFO selling reasonably well, and launched Guru Guru’s career. They’ve released over twenty studio album over a forty-three year period. The first of these albums was UFO. Stone In opens UFO. Ax’s searing, Hendrix inspired psychedelic guitar cuts through the arrangement. Its effects laden sound dominates the arrangement. The rest of rhythm section are left playing supporting roles. Briefly, Mani’s improvised vocal flits in and out. By then, Guru Guru are in full flow. Mani’s urgent drums join with Uli’s bass in driving the arrangement along. They’re still not equal partners. Not when Ax is unleashing a mesmeric, spellbinding solo. His fingers fly up and down the fretboard, as Ax delivers a guitar masterclass. It’s a stunning start to UFO, which showcases the combined talented of the classic lineup of Guru Guru, as they make their recording debut. Sci-fi sounds arrive from the distance, before Girl Call bursts into life. Ax’s bristling guitar, a buzzing bass and crashing cymbals join with pounding drums. There’s even a burst of feedback. Quickly, Ax tames the tiger, before taking centre-stage. He unleashes another scorching, psychedelic solo. Then the baton passes to Mani, who showcases his trademark drumming style. Uli’s bass matches him every step of the way. As the rhythm section power the arrangement among, the Ax man returns. Soon, he spraying blistering, machine gun licks above the rhythm section. Seamlessly, Ax combines speed and accuracy, as the musical shaman works his magic on a psychedelic, rocky opus. Literally, Next Time See You At The Dalai Lhama explodes into life. Guru Guru dive feet first into the track, with Mani and Uli creating a hypnotic, mesmeric groove. This allows Ax to unleash another barnstorming solo. Mani’s determined not to be outdone, and powers his way round his kit. Neither is Uli. The three members of Guru Guru raise their game. Elements of Led Zeppelin and Black Sabbath shine through. So do elements of avant garde, free jazz, psychedelia and progressive rock. Guru Guru play with confidence, swaggering their way through this genre-melting soundscape. UFO finds Guru Guru at their most inventive. They utilise the array of electronic that they took into the studio. The briefest bursts of guitar make an appearance as Guru Guru improvise. Elements of avant garde, experimental and musique concrète shine through, as Guru Guru eschew traditional song structure. What follows is a cinematic soundscape, where the listener supplies the script to what sounds like a journey. That journey is on Guru Guru’s UFO, as they take the listener to an unknown destination. A droning sound arrives from the distance on Der LSD-Marsch, which closes UFO. Like the previous track, Guru Guru improvise. This time, they create a lysergic soundscape. It’s dark, moody, eerie and ominous. Washes of guitar shimmer, while otherworldly noises squawk. Later there’s a series of beeps, as if Guru Guru’s UFO has landed, and is about to be impounded at. After that, Guru Guru return to a much more traditional song structure. Ax’s guitar references both blues and psychedelia. Mani’s pounds and powers his drums, while Uli’s bass runs match him every step of the way. However, stealing the show is Ax, who was the final piece of the jigsaw. His addition was a masterstroke. Not to be outdone, Mani unleashes another solo where his jazz roots are apparent. Later, Guru Guru become one, as they bring to a close their debut album. It’s Ax who steps forward and delivers another psychedelic solo, as Guru Guru close UFO with a flourish, and in the process, make their mark in German musical history. UFO was one of the best debut albums of the nascent Krautrock era. Nowadays, UFO is still regarded as a Krautrock classic, and is, without doubt, one of Guru Guru’s finest albums. That’s no surprise. The lineup of Guru Guru that played on UFO, is regarded as the classic lineup of the band. This lineup were together until 1975, when former Kollective guitarist Jürgen “Jogi” Karpenkiel replaced Ax. However, between 1970 and 1975, Guru Guru released eight albums. This includes 1971s Hinten, 1972s Känguru and 1973 Guru Guru and Don’t Call Us, We Call You. By then, Guru Guru were on a roll, and releasing some of the finest music of the Krautrock era. This music found a wider audience that many other Krautrock bands. That’s why, forty-three years after the release of UFO, Guru Guru released Electric Cats in 2013. This meant that they had released over forty studio and live albums. Guru Guru were still going strong after six decades and several changes in lineup. The one constant was drummer and vocalist Mani Neumeier, who nowadays, is regarded as one of the finest German drummers of his generation. He’s made a lot of music since UFO in 1970. UFO is a timeless Krautrock classic, which features the classic lineup of Guru Guru. Seamlessly, the three musical alchemists fuse avant garde, blues rock, free jazz, musique concrète, progressive rock, psychedelia and rock. The result is a truly groundbreaking journey, where gradually, Guru Guru show their inventiveness. Rather than dive in feet first with one of the more experimental tracks, Guru Guru showcase their considerable psychedelic talents on Stone In, Girl Call and Next Time See You At The Dalai Lhama. It’s only then that they introduce the listener to their most experimental music on UFO, and the the first half of Der LSD-Marsch. Guru Guru it seems, have been breaking the listener in gently, and educating them. Only then, are they ready to hear Guru Guru at their music inventive and innovative on two groundbreaking soundscapes. 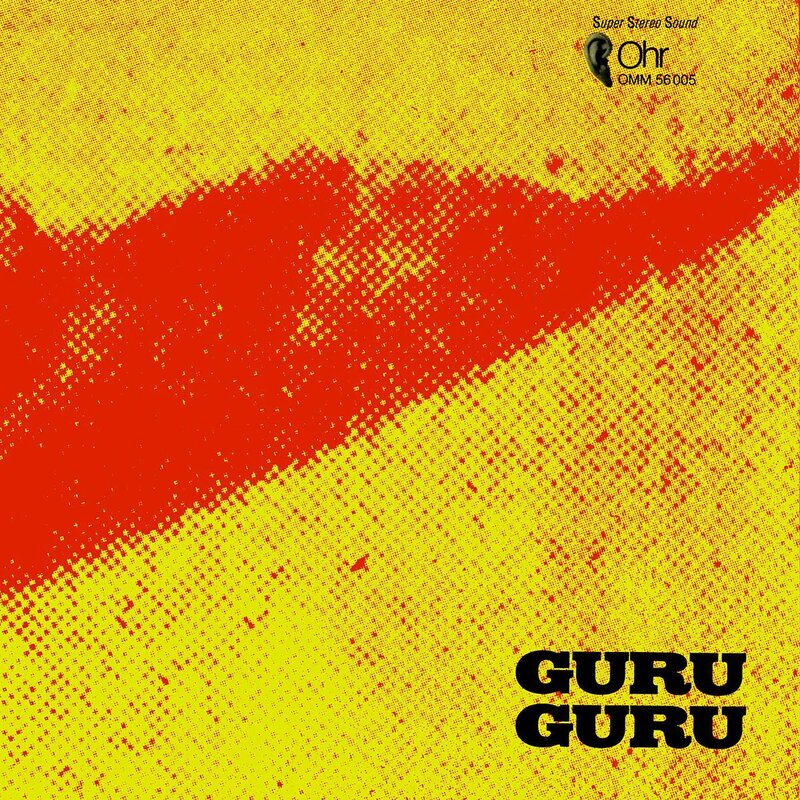 These two tracks show another side to Guru Guru, which references the group’s free jazz roots. UFO particularly, finds Guru Guru improvising, and pushing musical boundaries to their limits. In doing so, Guru Guru proved pioneers. Even today, Guru Guru’s influence an be heard on the latest generation of Norwegian musicians. Many of them, seem to have been influenced by groups like Guru Guru, and are picking up where they left off. It seems that Guru Guru’s music lives on through a new generation of musicians; and through a new generation of music lovers who have discovered their music. Many of those who are discovering albums like UFO, weren’t even born when the classic lineup of Guru Guru made their first tentative steps into the recording studio. They recorded what became a timeless Krautrock classic, UFO. Part of its success is down to Guru Guru’s latest recruit, Ax Genrich. His addition to Guru Guru was a masterstroke, in what was a musical marriage made in heaven UFO. ← THE ALLMAN BROTHERS BAND AT FILLMORE EAST-VINYL EDITION.